I guess we all can ascertain the complications and difficulties that is associated with being pregnant, especially the females or women that have experience such before. This status even gets more complicated if as a pregnant woman you are diagnosed with gestational diabetes. I am bringing some good news to as many of you that have found herself in this situation, there are some strategies or tips you can follow to maintain a healthy pregnancy. Read on as you take a look at 5 of them. Gestational diabetes is simply defined as a type of diabetes that some women may develop during pregnancy. One of the most common health complications during pregnancy, around two to 10 percent of expectant mothers are diagnosed with this condition. If blood sugar is not managed properly, this could lead to preeclampsia (pregnancy-related high blood pressure), caesarean delivery, an overly large baby, and other long-term health conditions that can affect you and the baby. So to help you survive the whole 9 months without further complications, check out these amazing tips collected from mothers, who have been there. While the whole experience can be both draining and frustrating, i have collected strategies from reliable sources that gives health-related information to keep it all together for you and your baby. It is normal that your family and friends will provide you with endless lists of diet tips and exercises upon knowing your diagnosis of gestational diabetes. Subscribe to all the attention instead of despising them. You can learn a lot of things that you cannot learn on your own. Try to focus on the positive side in every situation, makes it more bearable. This can be tedious but taking note of your glucose levels will pay off. More so, be prepared to take medications to manage sugar level. Now, if you are unable to maintain a normal sugar level, you doctor may recommend that you take medications. It is normal that you may have reservations taking in insulin, the popular medicine for diabetes, but a research published in Diabetes Care states that even the recent, long-acting insulin are safe to take during pregnancy. If you want to avoid medications, you must know how to control your diet. The American Diabetes Association recommends talking to a registered dietician, who can help you come up with a diet plan based on your height, weight and activity level. While it is frustrating that you cannot eat all those sugary stuff, but absence makes the heart grow fonder. 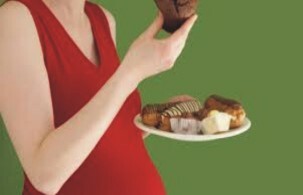 Look forward to eating your usual favorites after giving birth, once your sugar levels are back to normal. More so, while the diet may seem restrictive, you may get used to it once you've started it. One also recommends promoting the healthy eating habit to the whole family so you won't feel as deprived. Being active and regular physical activity is a must for pregnant moms with gestational diabetes. Regular exercise is also beneficial to overall health and may help to improve glucose metabolism. Do you find the article helpful? Don't forget to share on Facebook, Twitter and Pinterest by using the social media icons below. Let us know your own tips for surviving gestational diabetes as well by commenting below.